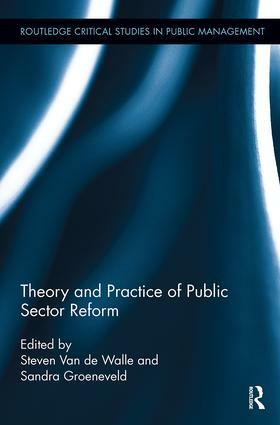 Theory and Practice of Public Sector Reform offers readers differing theoretical perspectives to help examine the process of public sector reform, combined with an overview of major trends in the core areas of the functioning of the public sector. The book consists of three parts, the first addresses a number of conceptual and theoretical perspectives on public sector reform. It shows how different ways of looking at reform reveal very different things. The second part addresses major changes in specific areas of public sectors – 'objects of reform.’ Part three focuses on the study of public sector reform. Aimed at academics, researchers and advanced students; this edited collection brings together many of the most eminent academics in the area of Public Policy and Management seeking to link to theory in part one and insights into specific thematic areas in part two, offering readers a display of theoretical perspectives to look at public sector reform. Steven Van de Walle is Research Professor at the Public Governance Institute, KU Leuven, Belgium, and Professor of Public Management at Erasmus University Rotterdam, the Netherlands. Sandra Groeneveld is Professor of Public Management at the Institute of Public Administration of Leiden University, the Netherlands.